It’s really gratifying when you see something you’ve invested time and patience with starting to bear fruit and justify why you started doing it in the first place. Leather and Lace (The Classic Rock Anthems and Power Ballads Show) has now finished its 1st official year of playing theatre shows – my first experience of regular gigs at such venues. I’ve explained in previous blogs why it was that Gary (Piears-Banton; bassist) and I started this project off some 3 years ago, but you’re always going to be in the dark as to how the general public receive you until you take the acid test of getting around the country. Musicality and musical accuracy is something I’ve tried to make L&L concentrate on from day one. Example: in the many years I’ve seen drummers in various cover bands play ‘Is This Love’ by Whitesnake, very few play it with the subtlety that Aynsley Dunbar exhibits on the hit single version that the MTV generation took to its hearts. There’s precious little use of crash cymbals on downbeats in verses as Dunbar plays it all with suitably quiet restraint. All too often, however, drummers I’ve seen in pubs and clubs don’t follow that pattern and simply over-play it. They’re still perfectly in time and they’re not making mistakes, but they’re not being faithful to the original. Theatre shows are a delight from a personal and somewhat selfish perspective. It’s 100% your show for starters, which initially means that no support band is going to rock up with absolutely no gear in tow and ask permission to use your drumkit. I’ve suffered pitted drum heads and cracked cymbals in my time of handing my kit over to a support band’s drummer, so to finish soundcheck knowing that nothing on the stage of anybody’s gear will get touched or moved before showtime is incredibly reassuring. You also know that you won’t be going onstage any later than around 8pm, as opposed to kicking off at a time like 11pm. There’s a certain attraction in knowing that at my age! Back in my 20’s, being given a stage time in a club after the pubs closed was mildly exciting, not to mention profitable. I can remember the old JB’s in Dudley benefitting from bands going on late as the pubs emptied and locals came to the club to party into the wee small hours, usually unaware of the type of live rock band they’d encounter. 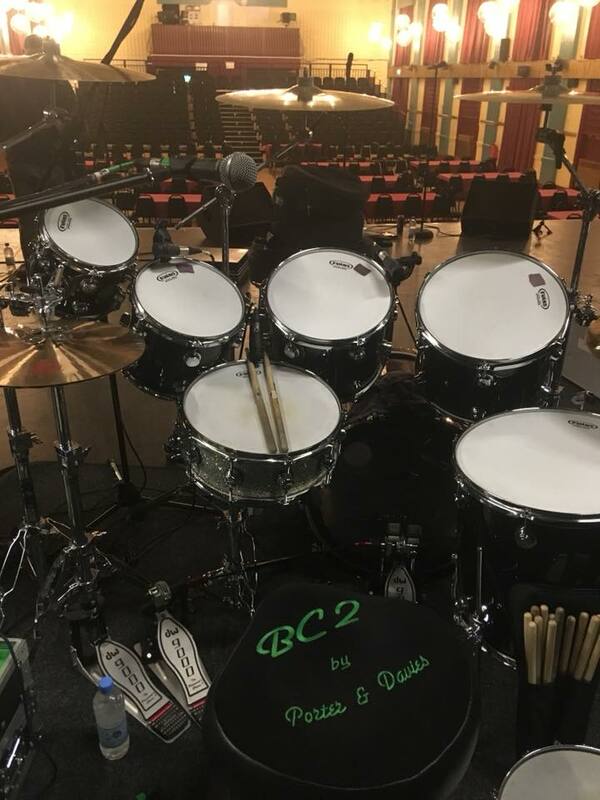 Theatre shows are a tad more civilised, then, as you’re usually packing away your drums before last orders – you still have your drive home, of course, which could mean 1 hour at the wheel or maybe 5 hours, but you’re more likely to get home before sunrise. Many’s the time that I’ve finally pulled up onto my driveway with that exact scenario playing out. The one thing you’re guaranteed in theatre shows is stage space. Gone are the days of me cramming my kit into a nook or crannie in a pub with amps practically on top of me and affording me no ‘escape route’ in and out without requiring a rope and tackle. With 7 of us to accommodate onstage, we need all the space we can get, and it helps to have our own ‘postcode’ (as it were) to set our equipment up. I have a Porter And Davies bass drum monitor, for example, that is one of the best pieces of kit I’ve ever got for my drums. The bass drum microphone is routed through a kind of pre-amp unit which, as well as connecting to the house PA, also connects to a special drum seat via a speakon cable. When you strike the bass drum with your pedal, the ‘feel’ of the bass drum is sent through the pre-amp & cable and into the seat which contains a number of transducers that instantly transmit the ‘feel’ of that bass drum hit into your backside as you play. I cannot tell you how much better and less rushed my playing has become using this contraption. The trouble with these wondrous drum seat thingies comes at gigs in confined spaces, where the bass drum mic not only picks up the bass drum, but also a plethora of things close by like bass guitar amps and keyboard low end, which in turn distorts what is transmitted to the seat beneath you i.e. no definition in the sound. In theatre shows, this is no longer a worry, given that the bass amp (for example) is usually a good 7-10ft away, allowing for better separation of instruments and less irritation for my monitoring. Another little bonus? The space afforded to us all backstage. No getting changed in the bogs nowadays – which always presented a myriad of potential hazards. Dressed To Kill normally only had one room to get changed into makeup & costume at our club shows, and we made the best of the limited space we had, but it never felt relaxing for the most part. At theatres, as I have now discovered, there are typically several dressing rooms that we can use – Tanyth is allocated a room of her own for her own privacy and to do her vocal warm ups. The rest of us take the largest dressing room available, although Mark as the other singer likes to find a room of his own elsewhere to warm his voice up for a time, and most venues can happily oblige with such an extra room. It makes such a difference to your pre-gig mood that you have more space to relax in, make a cuppa and gently insult your colleagues from a comfy chair. It may not take us the same length of time to get changed as it did for Gary & I in DTK days, but we do all take a certain level of pride in our appearance and a uniform ‘look’. We do try and present ourselves in a way that shows we haven’t just walked in off the street and run our fingers through our hair before going out on stage. Even I as the drummer hidden away at the back join in with our black/purple colour scheme that we settled upon very early in the piece for our wardrobe. But when all’s said and done, it all comes down to how well we sing and play, and how well we’re received. It’s been overwhelmingly positive from the audiences we’ve played to so far, and the slight adjustments we’ve made to the production of the show during the year have helped improve things all the more. Neil Peart once said of Rush’s music & lyrics that he wanted the audience to get the sense that ‘care had been taken’ in the preparation of either recorded material/lyrics or a live concert production. Well, we don’t have a huge wodge of cash to throw at production values for Leather And Lace, but that shouldn’t stop us from taking great care with what we can do and I only hope that comes across. I’ve spent years getting to a point where I have a drum set that sounds and looks the part, and I’m sure all the other instrumentalists alongside me feel the same about their individual set up with all their collective gigging experience and know-how. So as 2017 becomes 2018 and we look to spread the word more and more around the UK (and beyond? ), I hope you get to see it first hand, enjoy our step back in time and then spread the good word about Leather And Lace yourselves!